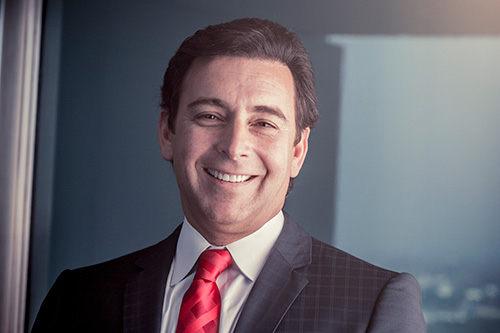 In an exclusive interview, Mark Fields, president and CEO of Ford Motor Co., peers into the future world of autonomous vehicles, on-demand transportation, and ride-sharing. 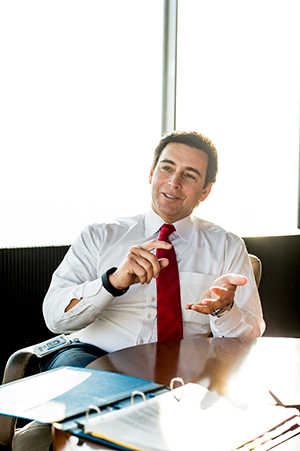 “Before we do anything, I gotta give you the tour,” says Mark Fields, CEO and president of Ford Motor Co. It’s 9 a.m. on a gorgeous fall day in Dearborn, and brilliant sunlight is streaming into every nook of his spacious corner office on the 12th floor of Ford’s world headquarters, the iconic Glass House. Although Fields has already been at work for hours — he typically arrives before 6 a.m. — he’s fresh and energized. The 54-year-old CEO has been on the job for 18 months, but he’s been at the company for virtually half his life, after being recruited by Ford in 1989. It’s obvious the view from where he sits at the very top thrills him. And now he’s spotted something he’s eager to share. He’s joking, but not so much. In his position, Fields not only has to keep a wary eye on what Ford’s traditional rivals are up to, but he also has to stay abreast of a slew of new competitors outside the automobile business who, every day, are forcing the Big Three to access their strategies and goals for the 21st century. As far as achieving his goals in the “one foot in today” category, there’s much to celebrate. At an early morning global town hall meeting just a few weeks earlier, Fields broke some exciting news to Ford employees around the world: Thanks, in large part, to flourishing sales of the F-150 truck and the recently-refreshed Mustang and Escape, among others, third-quarter earnings of $1.9 billion more than doubled the results from a year earlier, generating Ford’s best quarter ever in North America. Positive trends in Europe and South America also bolstered the good news, as Fields assured his global team of a strong fourth quarter, too, despite a predicted increase in material costs and signing bonuses that were part of the recently renewed four-year contract with the United Automobile Workers. Fields pauses, leaning forward in his chair. “We’re not just thinking about this as oh-my-gosh, we have to have an autonomous vehicle, or are we going to do a ride-sharing service, or things of that nature,” he says. “We’re thinking about it more holistically, about how do we make people’s lives better; we think of ourselves as a mobility company, and not just a car and truck company. Fields is quick to offer up the telling numbers supporting Ford’s commitment to its core business. “We’ve set end-of-decade goals to sell around 8 million vehicles or so,” he says, “and we’ve set a long-term goal, without a specific time limit on it, to be top-five in sales (in the world). Right now we’re No. 6. When you step back globally and look at the growth, today the global industry is about 85 million units, give or take. By the time we get to the beginning of the next decade, that should be over 100 million units. It’s an opportune time to ask him to comment on remarks Republican presidential candidate Donald Trump frequently made last fall, alleging Ford was fleeing the U.S. by building or planning new plants in Mexico — which offers an inexpensive entrée into South America, where some individual countries have high tariffs and import fees. Fields is equally intense and passionate when talking about Ford’s Emerging Opportunities category, the other company goal displayed in that infinity symbol. It’s a lot to ponder, and Fields hasn’t even gotten to how Ford can make an impact on how all these people are going to get around in a world that is rapidly becoming more crowded and less dependent on traditional forms of transportation. At the top of that list, he says, is the commitment Ford has made in Silicon Valley. As a result, Ford’s Silicon Valley operation is on the verge of receiving a significant upgrade. “By the first quarter of (2016) we’ll have 125 professionals there,” Fields says. “We probably have about 80 today — software engineers, some business development folks, control engineers, user experience engineers, a number of data scientists. What they’re working on is autonomous vehicles, connected cars, data, and analytics. And they complement the talent that we have here, and they feel like they are part of Ford. Of course, Fields readily affirms that the concept of Ford being a vital cog in a community of innovators and tinkerers isn’t exactly a reach. And with that, he’s again out of his chair, reaching for another document, showing an image depicting the Ford customer surrounded by a cluster of action words like Empower, Enable, Engage, Foresee, and Connect. To that end, more than 25 experiments around the world are in various stages of completion under the banner of Ford Smart Mobility. These experiments are focused on five areas: connectivity, mobility, autonomous vehicles, customer experience, and data and analytics. The experiments also include looking at multimodal travel solutions, which involve how people utilize various modes of transportation including cars, trucks, and public transportion (trains, buses, and even bikes) at various points in a single journey. One of the experiments, called GoDrive, is based in London. Touted by Ford as the frontrunner in offering one-way trips with guaranteed parking, the pay-by-the-minute car-hire service — in U.S. currency it works out to approximately $15 an hour — allows customers to utilize an app to select either a zero-emission Focus Electric or a Fiesta equipped with a fuel-sipping EcoBoost engine at 20 locations across the city. “Every company has to have a why, right?” Fields says. “Our why, as a mobility company, is making people’s lives better. So in the future we not only want to satisfy customers who want to buy, own, and drive vehicles the way they always have, but even in those areas where, from a mobility standpoint, people want access versus ownership. It all brings to mind the early days of Fields’ career at Ford, when he was based in Japan — the CEO of Mazda at just 38 years old, the youngest person ever to run a major Japanese company. It was when he came to appreciate the local term, nemawashi. Addressing the company’s future product lineup, Fields focuses on the strategy for Lincoln. “We’re really excited about where we’re heading with Lincoln,” he says. “As we’ve said in the past, our commitment is to turn that into a world-class luxury brand. We’ve spent a lot of time thinking through where do we want Lincoln to be positioned? And I think you can see (where we’re headed) through the designs of our new vehicles, the way we go to market, the advertisements, (the decisions) to not try and copy somebody else. When we introduce the new Continental (in 2016), that will be what I call the first phase of the Lincoln transformation. We have the new MKZ, the MKC — which is the small utility, MKX — which is the larger crossover, (that) we just introduced to the marketplace, and the Continental. That’s what I call phase one. As he peers down the road at his own career, Fields is planning to lead Ford for a long time. “I love what I do,” he says. “And because I love what I do, it energizes me. In these kinds of roles you’re always working; that’s why you have to enjoy it. I do a lot of exercise, mostly at night, because it’s a way for me to de-stress, to kind of process the day. So I work the physical and the mental.